Eucerin DermoPURIFYER Scrub is to be used weekly as part of a cleanse, clear and care routine. Its oil-free formula, with Lactic Acid, works directly where blemishes originate without drying out the skin. Pore-refining micro-particles gently exfoliate the skin without damaging it. Skin is noticeably clearer, smoother and visibly refined as a result. Between April and June 2005 16 women and 4 men, aged 13-34 years (with a median age of 18.5) participated in an open study in Germany. The six-week programme tested the efficacy of Eucerin DermoPURIFYER Scrub. The application of the facial scrub had a very positive effect on the general skin condition. It proved to be very well tolerated by patients with impure, blemish-prone skin or with mild acne comedonica. Apply Eucerin DermoPURIFYER Hydrating Care SPF 30 and massage gently into your skin. For best results, then apply Eucerin DermoPURIFYER Night Care and Concentrate. The Eucerin DermoPURIFYER Scrub can also be applied onto your back and décolleté. It works gently on reducing the appearance that impure skin creates. The pore-refining micro-particles cleanse deep into your pores, without drying out the skin. Acne is not a sign of poor bodily hygiene. On the contrary, too frequent cleansing of the skin with aggressive cleansing products can irritate the skin even more. Nevertheless, you should take care to cleanse your skin twice daily with a mild, nondehydrating facial cleanser in order to remove excess sebum, sweat and dead skin cells from the skin. One should, in any case, avoid "fiddling around" with your fingers on the acne symptoms. Will my acne clear up on its own as I grow older? Usually acne-related problems reduce with age. However, some patients continue to suffer from acne in their thirties. If you do not see an improvement, please contact a dermatologist. Can birth-control pills help against acne? Because acne is linked to hormonal imbalances and an increased sensitivity of the sebaceous-gland follicles, it can make sense for women to take contraceptive pills containing an anti-androgen component. I use make-up to cover up my acne. Am I making things worse? A good cleanse, tone and moisturise routine is in vain if your skin is regularly aggravated by comedogenic cosmetics. Ask your doctor or pharmacist for advice concerning the right choice of cosmetic products. 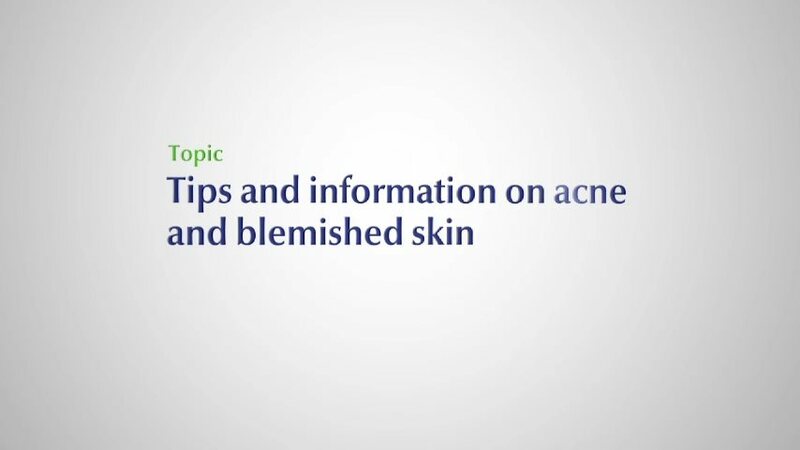 Dr Simone Presto, medical professional at Eucerin, gives tips and information on acne and impure skin.